The CRC-17 Compact Rain Cover is cleverly designed to fit and protect handheld camcorders against downpours. Fabricated completely from waterproof materials, the cover features a crystal clear TPU panel which allows control monitoring and viewing of the LCD screen at any angle. The cover slips quickly over your camcorder to protect it from sudden showers and is secured by two quick pull drawstrings that fasten tightly around the lens and your arm. 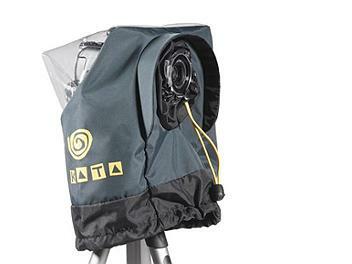 The CRC-17 is the perfect compact rain cover for small hand held camcorders. It features quick and easy set up, pull tight cords and a full size transparent window to monitor all controls when working. Simply tighten two drawstrings over lens and hand to keep the rain out and keep shooting. Hand sleeve with a one hand pull tight securing system.